(Bloomberg) -- Federal Reserve officials say they’re willing to tolerate an overshoot of their inflation goal. If the opposite happens, the plan is less clear. Core inflation, excluding energy and food prices, is currently just shy of the central bank’s 2 percent target. Most economists and policy makers see that lasting, though there’s no guarantee: Inflation expectations have been stuck on the low side, and a cooler housing market is among several factors that could weigh on future price pressures. 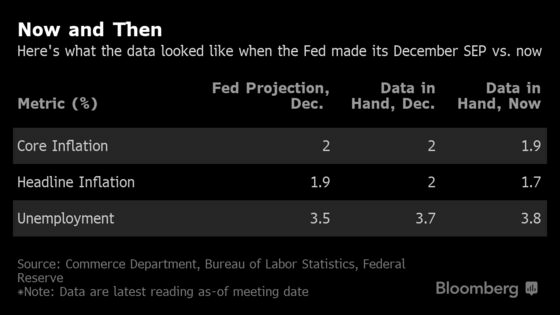 If price gains would slow down even as U.S. economic growth more broadly held up, it could put the central bank in a tough spot. Officials have already placed interest-rate hikes on hold amid muted price pressures and looming global risks. They could extend that pause, pledging to keep rates low until faster price gains materialize. But economists said actually lowering rates on an inflation miss seems unlikely, because it could signal undue pessimism. The stakes are significant. The Fed hasn’t hit 2 percent inflation on a sustained basis since formally adopting it in 2012. Officials had been hopeful that this would be the year in which they finally clinched their objective. Policy makers expected to hit 2 percent core inflation by the fourth quarter, according to their last set of economic forecasts, published in December. They also saw unemployment falling to 3.5 percent. Together with above-trend output growth, that laid the groundwork for the committee to project two rate increases this year. Officials will release a fresh set of projections following their two-day meeting that concludes Wednesday, and downgrades look likely. 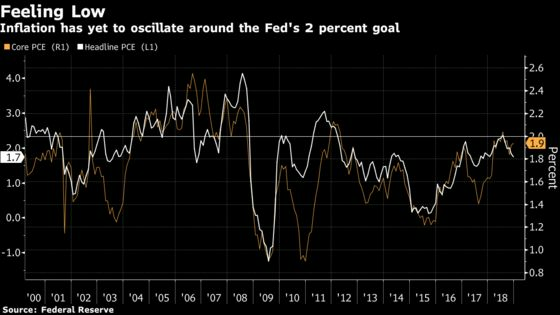 Economists surveyed by Bloomberg expect just once hike this year, in September, at which point the tightening cycle will have peaked. Unemployment has been hovering around 4 percent, so that projection could move up slightly. It’s less clear what revisions, if any, committee members will make to the inflation outlook. Regardless, there’s a real chance that price gains come in below 2 percent again this year, making it less likely that the Fed will achieve its symmetric inflation goal on a sustained basis this economic cycle -- potentially bad news for the central bank’s inflation-stabilizing credibility. The median estimate in a separate Bloomberg survey showed core inflation coming in at 1.9 percent this year. Estimates range as low as 1.6 percent. Inflation expectations -- which the Fed views as a determinant of future price increases -- have been coming in on the low side. They recently declined in a survey conducted by the New York Fed and tied a record-low in the University of Michigan survey in February before bouncing back in preliminary March data. So far, the Fed is answering low-inflation risks with patience. “With nothing in the outlook demanding an immediate policy response and particularly given muted inflation pressures, the Committee has adopted a patient, wait-and-see approach to considering any alteration in the stance of policy,” he said. If economic data overall should weaken sharply, the answer is simpler: cut rates. Markets are already pricing in future easing as growth shows cracks around the edges, with both industrial production and Empire manufacturing figures coming in weak last week. Coronado said she’d expect the Fed to act if payrolls slowed notably and growth fell below trend, which has been around 2 percent, in a way that looks likely to be sustained.